Our standard eye drop containing the lubricants Polyethylene Glycol 400 and Propylene Glycol. We have stocked this for a long time and find it helps people with intermittent or short term dryness. Although it has a very mild preservative – meaning that it officially should not be used with contact lenses – this same ingredient is used in contact lens solutions. The preservative allows this bottle to last 6 months from opening making it ideal for intermittent dryness. This is a thicker version of ‘Systane’ which delivers extended protection. Its lubricants are still Polyethylene Glycol 400 and Propylene Glycol and the same mild preservative. Patients generally find it less helpful for contact lens wear due to the thickness of the drop. Preservatives are present in some eye drops to inhibit bacterial growth and make them last longer once opened. Although most patients tolerate preservatives well, they can cause irritation to some patient’s eyes. That is obviously not ideal with a product designed to improve eye comfort! The common consensus among eye care professionals is that Preservative-Free Eye Drops are the Gold Standard for dealing with Dry Eyes. Systane Minims (single unit doses). The same product as above, but with individual doses or ‘minims’ preservatives are not present. Lubricants are still Polyethylene Glycol 400 and Propylene Glycol. Designed by Bausch and Lomb for relief of dry eye symptoms from environmental factors or using contact lenses. They deliver instant, natural hydration and contain the lubricant Sodium Hyaluronate. They are preservative free thanks to an innovative and unique dispenser which also has a Control Grip System to simplify handling. It can be used with contact lenses. 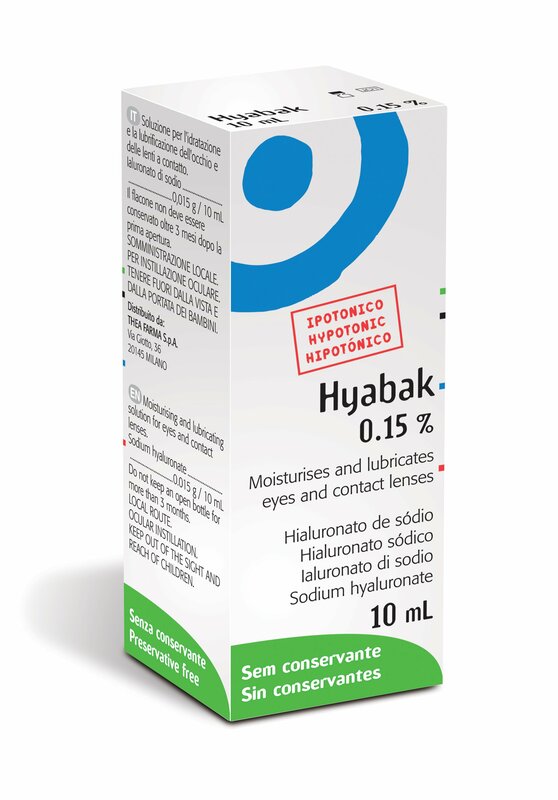 Spectrum Thea’s standard eye drop, it contains the lubricant Sodium Hyaluronate. It is suggested to use at least 1-2 times a day to get full use of the drops within the 12 weeks it remains protected from infection. For this reason we have found this drop very useful for moderate to severe dry eyes. There are no preservatives in this drop due to Spectrum Thea’s ABAK filter on the nozzle which contains a fine bacterial filter. It can be used with contact lenses. This advanced eye drop from Spectrum Thea contains Trehalose, a natural substance found in many plants and animals which can survive in extremely dry conditions. This drop works to protect your corneal cells rather than just lubricating the lid movement. As this is not a thick drop, it does not blur vision like other intensive tear drops. It is suggested you use it 2-3 times a day and lasts 8 weeks from opening. There are no preservatives in this drop due to Spectrum Thea’s ABAK filter on the nozzle which contains a fine bacterial filter. It can be used with contact lenses. This advanced eye drop from Spectrum Thea contains Trehalose, a natural substance found in many plants and animals which can survive in extremely dry conditions and Sodium Hyaluronate. This drop is designed to combine the cellular protection of Thealoz with the lubricating properties of Hyabak. As this is not a thick drop, it does not blur vision like other intensive tear drops. It is suggested you use it 2-3 times and lasts 12 weeks from opening. There are no preservatives in this drop due to Spectrum Thea’s ABAK filter on the nozzle, which contains a fine bacterial filter. It can be used with contact lenses. Vitamins and dietary supplements have long been used to assist general health. It is possible to get these nutrients from food. However some are easier to add into your diet than others. Also the high amounts of specific nutrients suggested to treat conditions such as Age Related Macular Degeneration (ARMD / AMD) can be hard to find in a balanced healthy diet. Age Related Macular Degeneration (ARMD / AMD) is a normal age related condition which typically causes a slow deterioration in central vision as we all get older. In most cases this is dry AMD, but in some unfortunate cases we find wet AMD which progresses much more rapidly and needs urgent treatment to save the sight in the eye affected. Prevention is much more effective than treatment and large studies have found some nutrients seem to slow the progression of dry AMD from getting worse, and a delay in any progression to wet AMD. If someone has wet AMD it is unlikely supplements will significantly improve macular health. However large dietary studies suggest someone with moderate to severe dry AMD could be helped by supplements designed for AMD. During your eye exam with us we will advise you on whether we think supplements would be beneficial for you. Designed for patients with AMD by French pharmaceutical company Spectrum Thea, it is a 1-a-day swallowed capsule containing antioxidant vitamins, Lutein and Zeaxanthin, Omega 3 Fish Oils, plus essential minerals. Designed for patients with AMD by Alcon, it is a 1 a day swallowed tablet containing Lutein and Zeaxanthin, antioxidants, vitamins and minerals. If you would like any more information about any of our eye care products and accessories, please contact us, as we will be pleased to help you.